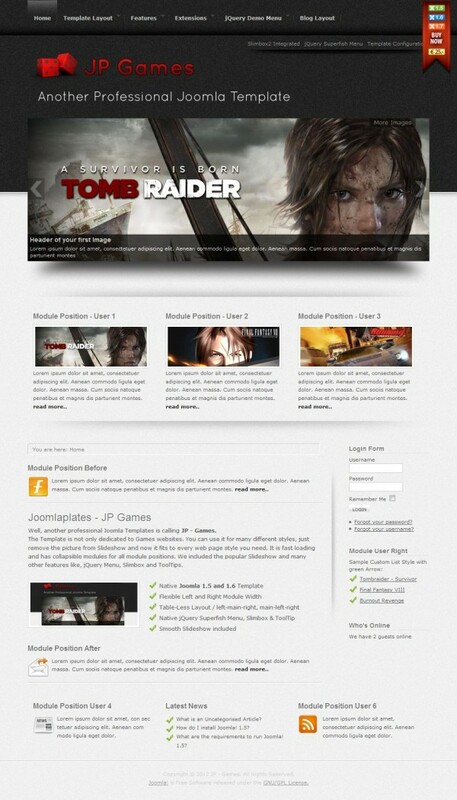 JP Games - professional template from the design studio Joomlaplates. This template has a high speed of loading pages and has a flexible modular design. The design layout is dominated by gray-black tones and 3 column structure. Perfect for creating sites of any subject. The very name of the March template JP Games for sites running Joomla 2.5, from studio Joomlaplates, tells its purpose - the game. The template is based on a 3-column layout oh, to increase functionality integrated into the template expansion: JQuery Superfish Menu, Slimbox and module Slideshow. JP Games displayed correctly in all modern browsers and mobile devices, has a high speed of loading pages. Fully compatible with Joomla 2.5.